This article is about the kings in Super Mario Bros. 3. For other uses of the term, see King. The kings are the monarchs of the various lands of the Mushroom World. Seven of them are featured in Super Mario Bros. 3, and each was turned into a different creature by the Koopalings. The kings are unnamed individually, although The Adventures of Super Mario Bros. 3 gave some of them unique identities, and The Super Mario Bros. Super Show! even introduced several similar characters and territories. Like Princess Toadstool, they have Toad helpers. 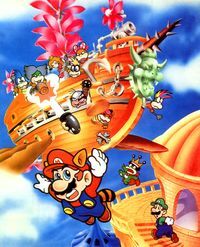 The transformed Water Land King pointing at the Koopalings' airship in Super Mario Bros. 3. The Koopalings invaded seven kingdoms of the Mushroom World, stealing the royal magic wands and using them to transform their kings into various creatures. With the king in his vulnerable state, the evil Koopaling then ruled over the world in the king's place, with Boom Boom and the Koopa Troop forces placed all over the kingdoms. Renowned heroic brothers Mario and Luigi of the Mushroom Kingdom arrived to help them, first starting with Grass Land. To save a king, the Mario Bros. have to go to his castle, where the Toad pleads the heroes to restore the king by taking the magic wand back from the Koopaling. After that, Mario and Luigi must assault the airship, defeat the Koopaling, and return the king back into his human shape. He thanks the Mario Bros. for saving him, and he delivers a letter from Princess Toadstool enclosed with a "jewel" (or power-up). If the player manages to restore the kings to their human forms while wearing a special suit, then they get different rescue dialog for each different suit. This continues until the brothers reach the forbidden kingdom of Dark Land, where Bowser ended up holding the princess hostage. In Super Mario Advance 4: Super Mario Bros. 3, if the player defeated Bowser before saving the kings, upon selecting the castle, the player is treated to a cutscene where it shows the Koopaling of the respective world invading the castle, snatching the magic wand and using it to transform the king, and then escaping seconds before Mario arrives. In addition, because Princess Toadstool has already been saved beforehand, the king does not give the player a letter from her. The Water Land King, after being turned into a kappa. Grass Land King – Turned into a dog (a Cobrat in the SNES and Game Boy Advance remakes). Desert Land King – Turned into a spider (a Hoopster in the SNES and Game Boy Advance remakes). Water Land King – Turned into a kappa, resembling a Spike (a Dino Rhino in the SNES and Game Boy Advance remakes). Giant Land King – Turned into a dinosaur (Donkey Kong Jr. in the SNES and Game Boy Advance remakes). Sky Land King – Turned into a vulture (an Albatoss in the SNES and Game Boy Advance remakes). Ice Land King – Turned into a seal (a Monty Mole in the SNES and Game Boy Advance remakes). Pipe Land King – Turned into a Venus Fire Trap (Green Yoshi in the SNES and Game Boy Advance remakes). The Adventures of Super Mario Bros. 3 created personalities for several rulers. Many, if not all, of them also looked different. The king of Water Land bears a striking resemblance to Mario. Also, the castle's island resembles Japan, with the castle itself placed where Kyoto, Nintendo's headquarters, would be. All of the transformed kings are depicted with generic crowns either on or near them, despite the fact that only four of the non-transformed kings wear crowns. This page was last edited on February 17, 2019, at 00:32.